An extensive range of cuisine is offered, ranging from traditional Rajasthani to the world favourite Thai, Japanese, Continental and Lebanese fare. 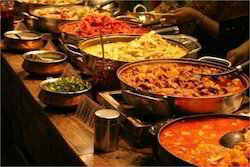 Food sampling is facilitated as and when required. The Dining Room is cozy, and provides a perfect European experience. Savor a range of distinctive cuisine’s offering diverse exquisite flavors, created by the chef’s culinary expertise. Food Service - Table Service, Buffet Service, Banquet, Table Service, Cafeteria Service Take-out Service, Car-hop Service etc. Our supreme quality services are offered for any kind of special event or parties like wedding, birthday, anniversary etc. Our trained and experienced chefs are experts at preparing various kinds of delicious cuisines that are widely appreciated by our clients.